The AeroCone Rain Collector reduces wind-induced errors by providing a more aerodynamic path around the collector. The design improves rain data accuracy in high wind situations where the horizontal wind velocity can cause under reporting. 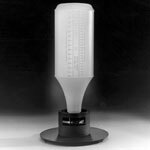 The 260-6463 AeroCone Rain Collector is designed to meet the guidelines of the World Meteorological Organization. Rain enters the collector cone, passes through a debris-filtering screen, and collects in one chamber of the tipping bucket. The bucket tips when it has collected an amount of water equal to the increment in which the collector measures (0.01" or 0.2 mm). As the bucket tips, it causes a switch closure and brings the second tipping bucket chamber into position. The rain water drains out through the screened drains in the base of the collector. The collector is designed for years of accurate, trouble-free service. The shape is aerodynamically designed to minimize rainfall catch reduction caused by high winds. 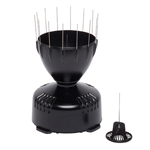 The body and base of the collector are constructed of tough, UV resistant plastic; the tipping bucket pivots on bearings that minimize friction and wear. Stainless steel adjustment screws under each chamber of the tipping bucket allow you to fine-tune the calibration of the rain collector. 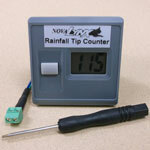 The 260-6465 rain collector comes with a mounting base that can be mounted to a pole or post. The 260-6463 has a flat surface mount. 250-6465M and 260-6463M are factory-calibrated to report 0.2 mm per tip. The 260-7721 Rain Collector Cone and Heater is available for use with either of the rain collector units. 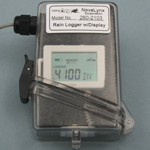 This heater allows the rain collector to measure the moisture content of snowfall.